Offer 1 Insect-Type monster on your side of the field as a Tribute to inflict 800 points of damage to your opponent's Life Points. Wow. A card so narrow in its use that even the most original of players wouldn't play it. A 0/1600 monster...meaning this thing won't be around very long...will get killed by most Beatdown monsters even when it's in DEF (but will survive Control monster assaults.) If it's ever in ATK...it's like a direct attack. Ouch. It could attack under Gravity Bind...but it has no attack to speak of. The only deck that could make use of this card is an Insect Stall deck -- and the last time I checked, none of the good stall monsters were insects. Sorry for the blatantly short review, but this card is complete and total trash. 1/5. Today we review Anti-Aircraft Flower, a(nother) common from IoC. First of all, we can see that the stats aren't great. 0 ATK is nothing to brag about while 1600 DEF makes this card just not Witchable, quite a downside. It can, however, be searched by Sangan and Giant Rat. The effect is mediocre. It's basically a pumped up Cannon Soldier, but for Insect Decks only (sort of like Gravekeeper's Cannon Holder). It can't offer itself, not being an Insect; so you'll need to find some bugs you won't mind nuking. Pinch Hopper is an obvious choice. Rather than waiting for your opponent to get rid of it, you can sac it yourself, summon an Insect from your hand, and do a nice 800 damage in the process. Another card this works well with is Man-Eater Bug: Flip it, destroy an opponent's monster, then get rid of it for 800 damage. When Insect Queen comes, this card gets even more useful; in addition to the Pinch Hopper combo to summon her, you can sacrifice the tokens IQ produces for some quick damage. 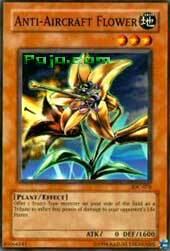 The uses of Anti-Aircraft Flower are pretty limited, and it would be a terrible topdeck. It could work, however; and it's probably worth at least side decking in an Insect deck. Stats: Anti-Aircraft Flower is a Level 3 Earth/Plant, a sensible combination, but over-shadowed by the fact that most recent, good plants are Water Creatures. No restrictions on summoning, so as a Level 3 it can be dropped with no trouble. Since its ATK is 0, it won’t be attacking under Gravity Bind without assistance, but that’s not why we’d be using it anyway. At least this means that Sangan and Giant Rat can search it out. It has a DEF of 1600, which is enough to handle some weak support monsters, but nothing heavy. Effect(s): This card allows you to tribute insect monsters to inflict 800 damage. This is some solid damage. But is the effect any good, since its so exclusive? Uses/Combinations: DNA Surgery. Messenger of Peace. Swarming monsters. This things can give you tons of fuel for the Flower. Scape Goat. Turn Multiplication of ants into 1600 points of burn damage. You could also use Insect Barrier then to protect yourself too. Perhaps stick it in with insect Princess, since her deck likes DNA Surgery as well. Skull Lady Bug would give you 800 damage and +1000 LP for yourself. Oh, and then if you actually do run an insect deck, its something to consider. Casual: 2/5-What, I never said it was good. It does have its place, and any DNA Surgery deck might consider it as a back-up burn plan at least. Tournament: 1.75/5-This card is moderately useful for a very few decks that would be moderately successful. Limited: 2/5-The Defense is more useful, and we have a few decent, common Insects in this set. If you can pull a few, this is a sick combo. You start with only 4000 LP. If you can get the bugs out, you can chip away at a ton of LP. It’s a sizable “if” though. Omega Anti-Aircraft Flower just might be one of the most mediocre burn cards in the game. Not only are you limited to sacrificing just 1 monster per turn, but also that monster must be of the insect type. Cannon Soldier is “much” better. Where as Cannon Soldier may do less damage, but you’re allowed to sacrifice any monster(s) you want. Even when combo’ed with DNA Surgery this card is still does not deserve a place in even the worse of burner decks. And with 0 attack you won’t be making any lucky attacks on your opponents life points, however I suppose with 1600 defense it could provide a lackluster defense against a few monsters. Anti-Aircraft Flower gets 1/5, it’s only “saving grace” is a nearly impossible combo with DNA surgery. dawnyoshi Anti-Aircraft flower...wow, I think certain people at Konami just like to make the plant sub-type look really awful. This card deals 800 damage if you sacrifice an insect on your field, which can combo with multiplication of ants, but it's still not going to be that much damage, you'll be wasting valuable card space, and this monster will most likely die before using its effect, unless you summon it in attack mode...frankly, I'd laugh if someone did that. A little more useful in limited, as there's only 4000 life to start out with...still pretty bad though.